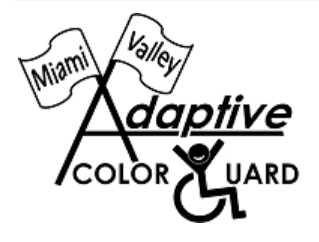 Hi, I am Cathy Barnes and I am the founder and co-director of the Miami Valley Adaptive Color Guard. I taught for Miamisburg City Schools for 38.5 years. I was the director of the Miamisburg High School World Guard for 26 years. During that time the World Guard achieved Gold medals 3 times and silver and bronze medals many times. I then went on to start the junior high program as well as the elementary program. I was a feature twirler at my school, Sycamore High School in Cincinnati and was Captain of the Miller Blackhawks Twirling Corp. I was a United States Twirling Association Judge for 15 years and have been judging colorguards in band competitions and winterguard competitions for the past 30 years. Hi! My name is Emily Karwisch. I am one of the co-directors for the MVACG. I am a first grade teacher in Miamisburg and I live in Lebanon with my husband, Dan. I've been a part of the colorguard activity for 17 years. I began with Cathy Barnes-Miller teaching me the "basics" of guard in my mom's classroom before school when I was in third grade (they were co-workers). I continued on through the elementary guard, junior guard, A guard, and the world guard. Before my sophomore year of college at the University of Dayton, Cathy called me and asked if I'd like to be a part of starting this program. Without hesitation, I said yes! It truly has come full circle for me. I am so lucky to be a part of such a magnificent organization. These performers and their families are outstanding people and I am blessed to work with them. I hope you are able to come out and see them!